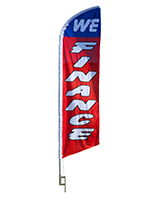 Each Sale Flag is Made from Polyester, Making the Material Lightweight. The Sign Display is Large Enough to be Seen from Afar. 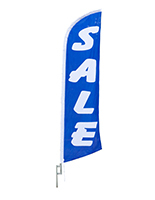 This Sale Flag comes with Lightweight Aluminum Pole. 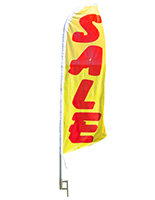 The sale flag can be place into any soft surfaces. Why does this banner sell at such a low price? 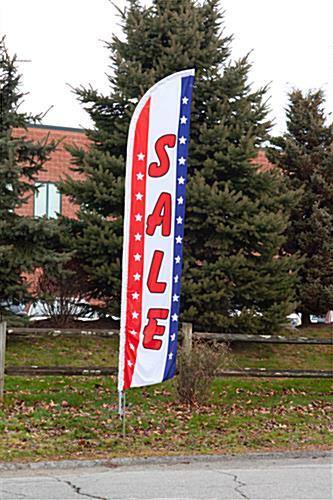 The reason is this patriotic sale flag comes with an aluminum pole instead of a fiberglass pole. The only real difference between fiberglass and aluminum is that fiberglass is a bit more durable, but sells at a much higher price point. 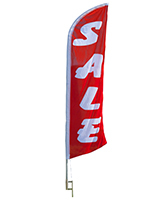 This patriotic sale flag also comes with one metal stake. 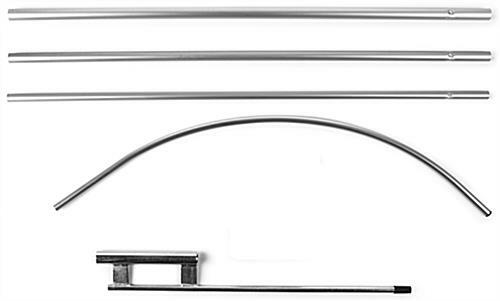 The feather banners stake can be driven into soft surfaces up to two feet. The patriotic feather flag can be used in winds up to 40 MPH. Another reason this feather banner sells at a reduced rate is the fact that this display does not come with a nylon carrying bag. 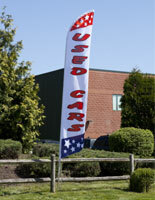 Each sale flag can be used at auto body shops. 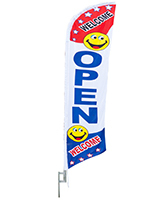 A single sided, dyed sublimation process is used to imprint the graphics onto the flag. The dye-sub printing process results in the reverse, mirror image of the graphic being visible on the back of the patriotic sale flag. No matter which direction traffic is coming from, cars will see the colorful message imprinted on this banner! 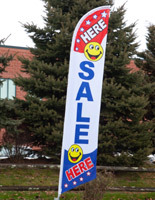 This patriotic sale flag that is large and vibrant demands attention from passing customers! Assembly of this banner is simple, requiring one person and a couple of minutes to complete! 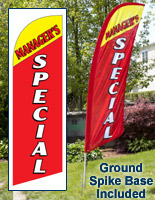 Only a hammer for the ground spike is needed when setting up this patriotic sale flag. This feather banner's message of 'SALE' and the patriotic theme appeals to two of American's basic values; saving money and patriotism!